In June 2018, VA announced a contract with Cerner Corporation to bring the Cerner electronic health record system onboard as the replacement for CPRS/VISTA (the legacy VA electronic health record system—CPRS stands for Computerized Patient Record System and VISTA stands for Veterans Integrated System Technology Architecture). This effort will involve a large scale cultural transformation as well as business process transformation for one of the largest healthcare systems in the United States. This transformation will assist VA in its dual goals of interoperability with the Department of Defense (DoD) and with many private sector healthcare systems (since Cerner complies with modern data exchange standards as well as hosts the CommonWell Health Alliance - Health Information Exchange network). For VA research, the Electronic Health Record Modernization (EHRM) effort offers several opportunities. First, Cerner hosts a robust data warehouse platform (HealtheIntent) that represents a signifcant technology upgrade from existing Corporate Data Warehouse (CDW) hardware platforms. Unlike the CDW, the HealtheIntent platform can host data from outside sources, from patient generated data (patient portal), payers, outside pharmacies, and wearable devices (Figure 1). Additionally, the Cerner contract provides VA research with PowerTrials as part of Cerner Millennium (the main EHR replacement for CPRS/VISTA). PowerTrials provides a cohort qualification tool based on the characteristics of potential study patients and allows a clinical trial team to ‘qualify’ potential subjects for recruitment and enrollment. The governance of this massive project is being handled at the Secretary-VA level. The EHRM program office reports to the Secretary through the Deputy Secretary. 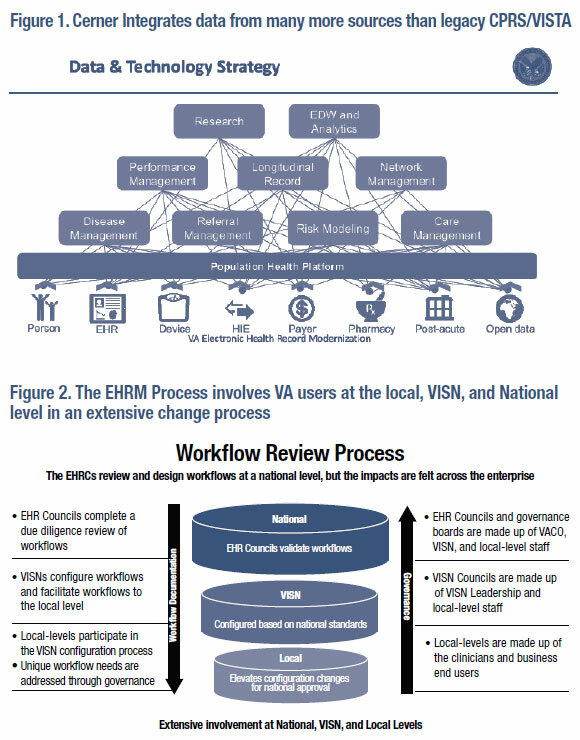 EHRM has organized the principal VA Central Office program offices into working groups and involves informatics teams at the national, regional (VISN -Veterans Integrated Service Network), and VA Medical Center level (Figure 2). The initial phase of the program (Phase 1) involves EHRM implementation at VAMCs in the Pacific Northwest and will follow DoD implementations down the coast and then across the country. It is expected to take 8 to 10 years to complete the national implementation at all VAMCs.